One of the yearly running jokes in my house is that I repeatedly end up baking my own cake for my birthday. There’s no need for repetition here but you know that baking is my thing, so I really don’t mind spending some time in the kitchen, even on my date of birth. I must confess though, I miss my mum’s birthday cakes. (I recently saw a polychromatic one which reminded me of those number cakes she used to make me when I was little.) It was already so hot that morning that I almost gave up. However I still wanted cake and/or cupcakes but I wanted a no-fuss recipe, and came across this one. Now hands up all those who love a good drizzle cake. One of my hands is up, while trying to type with the other. If you are a regular reader of mine you will have come across or searched for lemon drizzle or something of the sort and your search would have been very successful. I have lost count of the lemon bakes on C&T, so why not throw in another one? Well, this is really an orange one but it’s close enough. And it has melted chocolate on top, which is even better. In my mind this cake invokes memories of going to those many beloved National Trust properties during our years in the UK. Places so lush and green and beautiful. You could just sit at one of their refurbished cafes, with a coffee and something homey like this. Sorry, I just don’t drink tea. So while watching the media in front of St. Mary’s Hospital in London, waiting for a certain British princess to show her lovely little face, I put this cake together in no time at all. I mean, we share the same birthday so I just had to watch. Plus my FB page was full of comments like “Congratulations on sharing your birthday with the princess!” It’s so easy and quick. The only time I felt impatient is while waiting for it to be baked. Not the baby. The cake. It’s good. Like melt-in-your-mouth good, and it is a perfect cake for an afternoon tea. Coincidentally I had some friends for tea in June, and my morning baking marathon resulted in two cakes and a mighty batch of chocolate brownies, notwithstanding my so-called fear of the oven in hot weather. I will definitely post something on that on one of the coming Tuesdays. What I really wanted though was scones and strawberry jam. There was no time to faff with the dough, but I will try making some one day. In the meantime I’ll have to on a hunt for some, and bake something as easy as this if and when I’m craving something sweet. Keep me posted and good luck! Trust me though, you will not need it! Preheat the oven to 180°C/Gas mark 4. Grease and line a 900g loaf tin with baking/parchment paper. In a large mixing bowl cream the softened butter and sugar until this mixture turns a light yellow and is fluffy in texture. Beat the eggs in, one at a time. Add the orange zest, sifted flour, baking powder and milk, and fold in using a spatula or a spoon. Tip the cake batter in the prepared tin and bake for 35 to 40 minutes until a skewer or knife comes out clean. Once the cake is out of the oven, place it on a wire rack and leave it to cool in the tin for around 10 minutes. In the meantime prepare the drizzle. Using a small pan, pour in the fresh orange juice and icing sugar and gently heat them until the sugar has completely dissolved in the liquid. Do not mix with a spoon, but slowly stir the pan from the handle over the heat to help it along. Bring to the boil and leave it on the heat for a minute of two. The liquid should look syrupy. Remove the pan from the heat. While the cake is still in the tin, poke holes in it using a thin skewer or even a dried spaghetti strand. 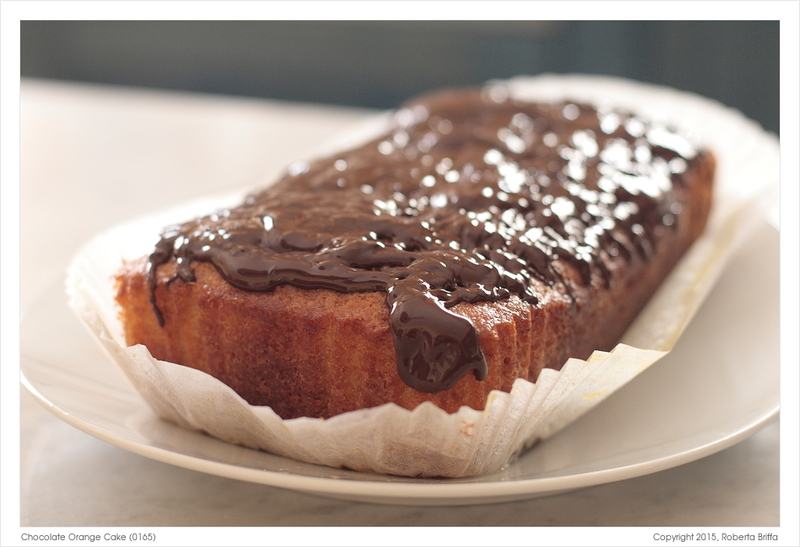 Pour the orange drizzle all over the cake and let it slowly sink in. Slowly and carefully lift the cake from the loaf tin and place it on a plate or cake stand. Melt a 100g bar of dark chocolate in a heatproof bowl over simmering hot water. When the chocolate is completely melted, pour it all over the cake. Leave it to set until you are ready to eat. Or not. Thanks for the visit to my site and congrats on a great blog and finishing blogging 101. Thank you Alex, I prefer the taste of lemons too but surprisingly I enjoyed this. My mum is a huge fan of oranges and chocolate, so this recipe reminds me so much of her! Your blog is bookmarked on my computer and is becoming a regular! I simply love this recipe. Mum is not too keen on chocolate and orange, but I just love it. I am sure my sister and nephews will devour it… I have a microwave / convection oven, i.e. the small option instead of kicking up my large oven… that will avoid heating the house. Might try it this weekend!